The world that I knew as a kid was far different than that of most other children; however, at the time, I had no idea. I thought that every child had grandfathers who were coalminers, a father who bucket fed orphaned calves, a grandmother who spoke about Jesus as though she knew him personally and a mother who wasn’t above forcing her disobedient son to snap a green branch from the willow tree out in the front yard. I grew up Appalachia and Appalachia was all I knew. It was not until I reached the golden age of 18 and moved away to college in a distant city that I slowly began to realize just how unique and wonderful my life’s experiences had been compared to so many others. My first day of living in a freshman dormitory, I evoked the laughter of the entire floor when I used the word “warsh rag” to describe the newly purchased wash cloths my mother had included in my bag of necessities. In the world that I came to age in, that’s what they were called and that was the only thing they were called. In the days, weeks and years that followed, I would one by one learn that the way we spoke as a child was far different than how most others talked. To my astonishment, I discovered that a “mountain holler” was actually spelled an pronounced as “hollow”, I also faced criticism for pronouncing wire as “war”, fire as “far”, and tired as “tarred”. 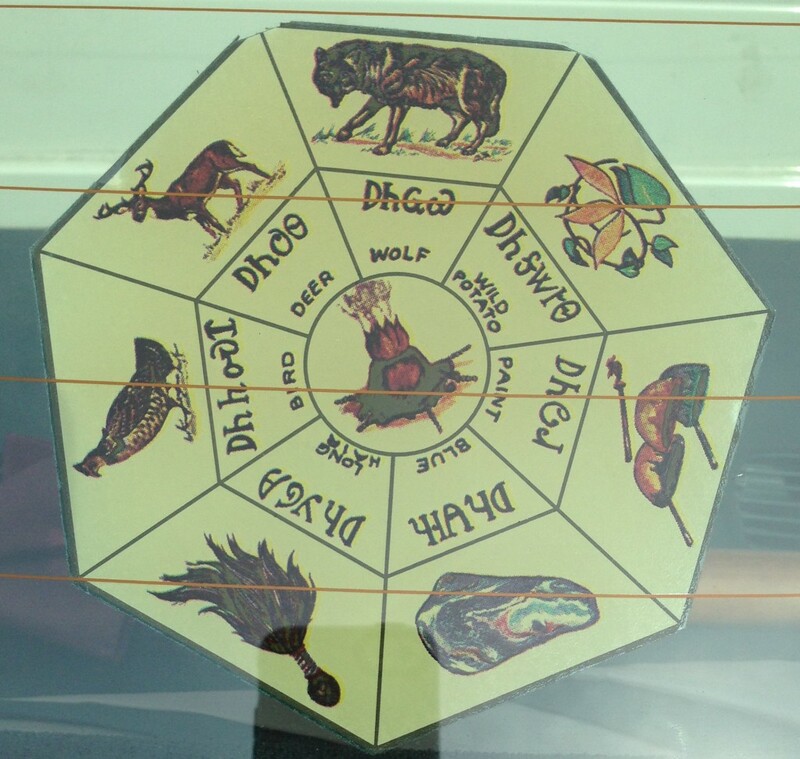 Through the years, my classmates, teachers and employers have all attempted to either correct my pronunciations or berate me for speaking this way; however, I have since learned to be proud of my Appalachian-English and that there are many linguistic experts who have come to our defense in recent years. Join us this Thursday, Feb. 7, at 2 p.m. when we host Dr. Benjamin Steere of Western Carolina University. Dr. Steere, author of “The Archaeology of Houses and Households in the Native Southeast,” will introduce participants to the world of the prehistoric Cherokee who lived in the Southern Appalachians. Reserve your seat by calling (770) 720-5967. The cost is $10 (or $5 for members). 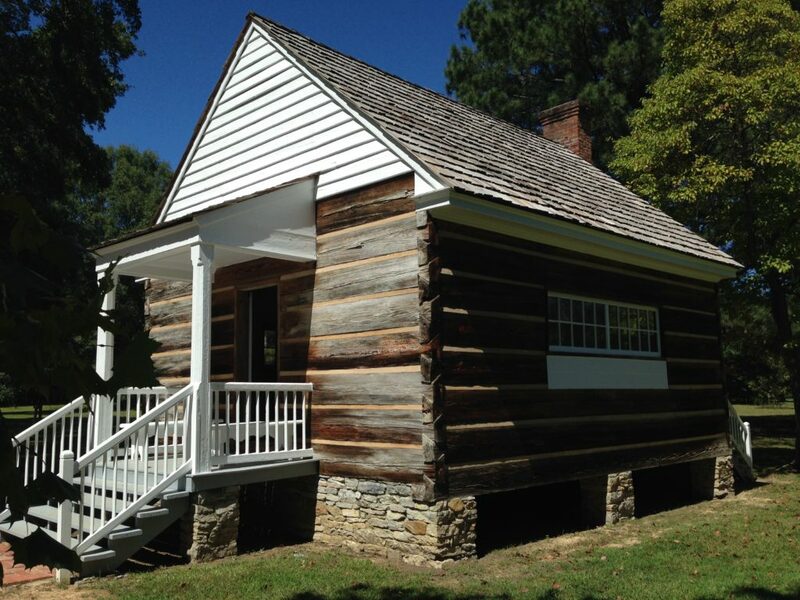 On Saturday we had the pleasure of visiting New Echota State Historical Site near Calhoun. 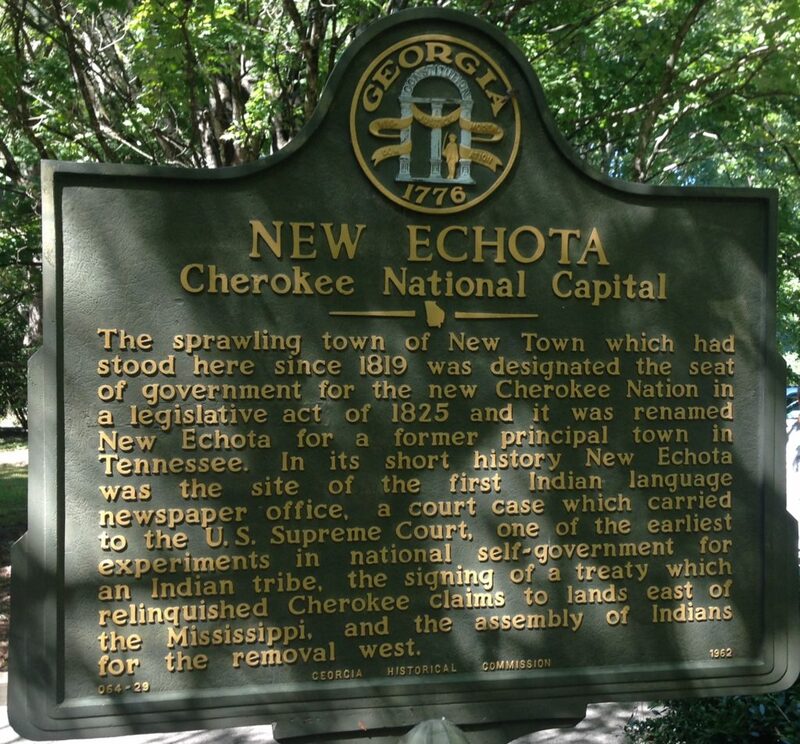 New Echota was the capital of the Cherokee Nation from 1825 until 1838, when U.S. government forces, under the command of Winfield Scott, rounded them up and forced their removal to Oklahoma. 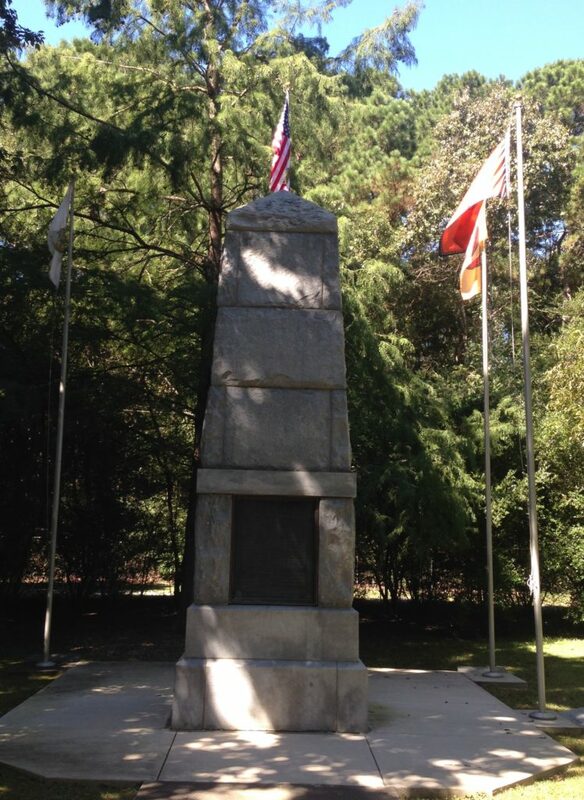 This is the infamous Trail of Tears, and a monument commemorates this as you arrive at the visitors’ center. A plan of the site. Alas, the Worcester House (8) is the only original building here. 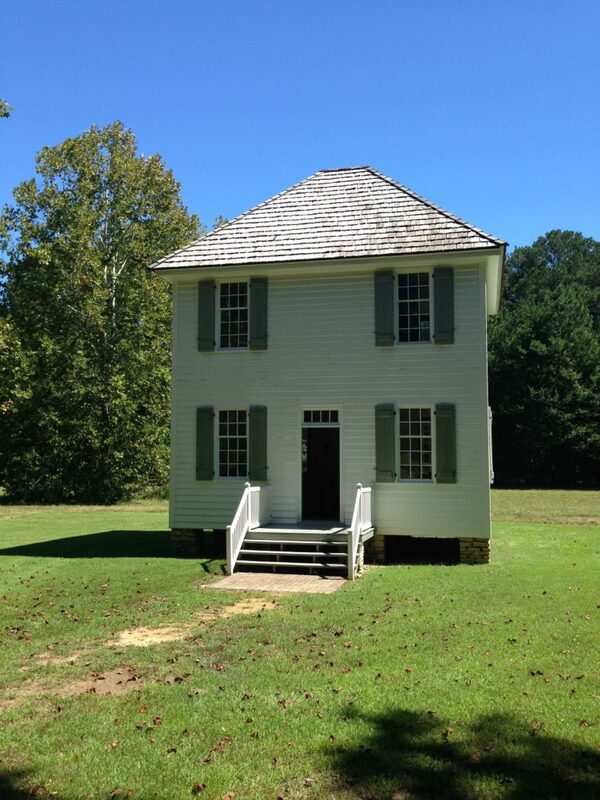 This was the home of Samuel Worcester, a missionary to the Cherokee and publisher of the Cherokee Phoenix (see below). Convicted by the state of Georgia for living in Cherokee territory without a license, Worcester appealed to the U.S. Supreme Court, which found the Georgia law unconstitutional, as it was the federal government that had the exclusive right to treat with Native Americans. President Andrew Jackson is reputed to have said in response that “John Marshall has made his decision; now let him enforce it!” Worcester went west with the Cherokee and died there in 1861. …or the Supreme Courthouse (4), which doubled as a school. 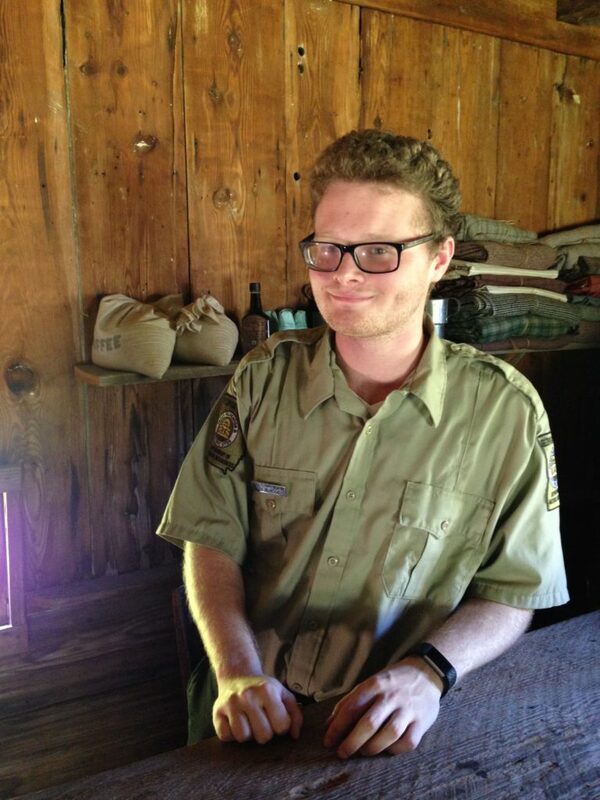 What made this visit especially pleasurable was to see Reinhardt history graduate Cole Gregory, now employed with the state parks service. Here he is in the Vann Tavern (9), explaining how it worked (an interesting detail: a window on the back served as a drive-thru for people that the manager did not want coming in). 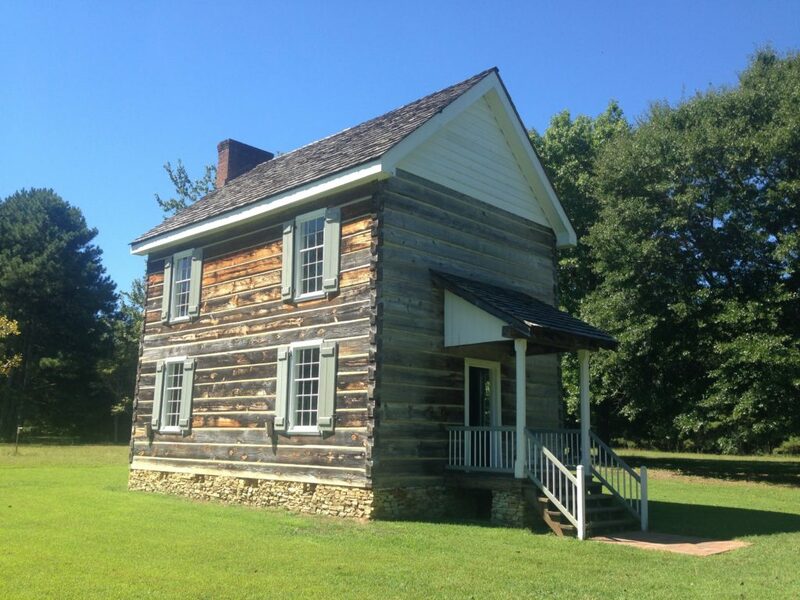 James Vann was a Cherokee leader who owned several taverns; this one does date from the early nineteenth century but was originally located in Forsyth County and moved here in the 1950s. 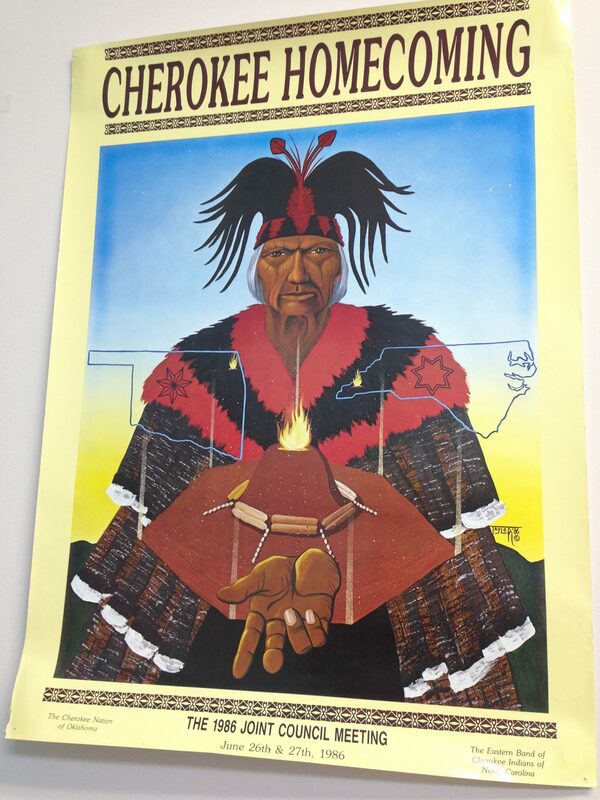 The reconstructed Print Shop (11) represents the locale of the famous Cherokee Phoenix. A friendly and knowledgeable volunteer explained things to us. The newspaper was largely written by Elias Boudinot, who believed that relocation to the west was in the best interests of the Cherokee and who thus signed the Treaty of New Echota with the federal government. This “Treaty Party” represented a minority of the Cherokee Nation, and the signatories, including Boudinot, were assassinated not long after they arrived in Oklahoma. We were pleased to find this book in the gift shop. 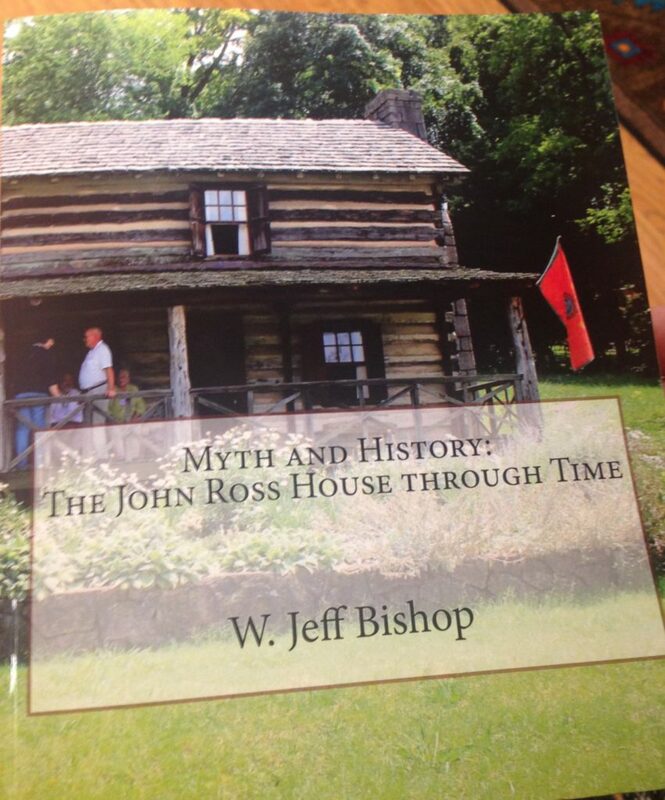 John Ross was a Cherokee leader who opposed forced resettlement in the west; his house is in Rossville, Georgia, less than 1000 feet from the Tennessee state line. Jeff Bishop is Reinhardt’s new director of the Funk Heritage Center and, as you can see, an expert in Cherokee history. On our way home we stopped at the Rock Garden, situated behind Calhoun’s Seventh-Day Adventist Church. 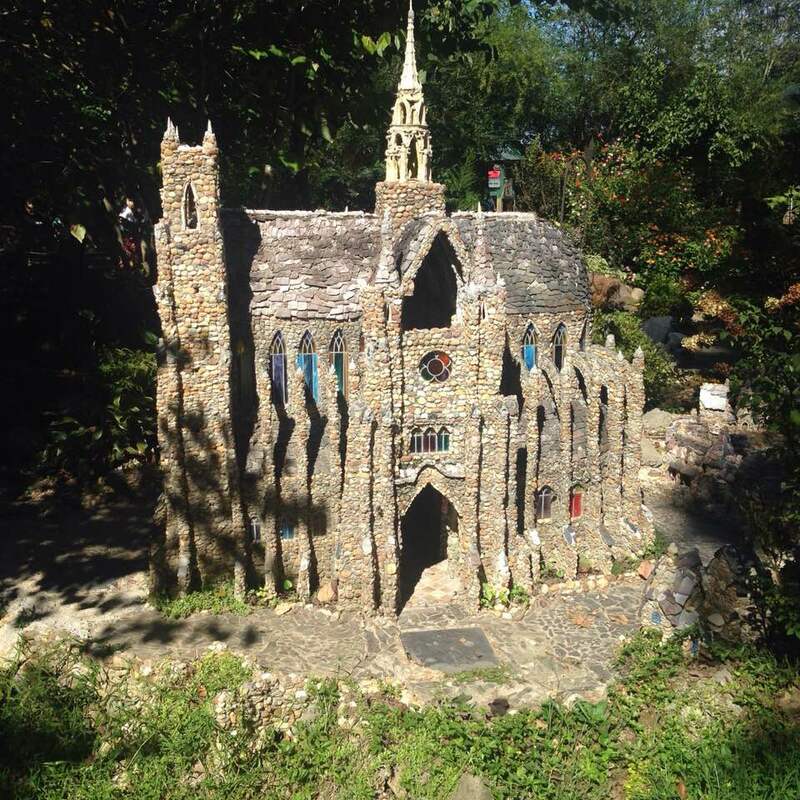 The Rock Garden is the creation of one DeWitt “Old Dog” Boyd, and features sculptures made up pebbles glued together to form miniature buildings. My favorite was this interpretation of Notre Dame cathedral, complete with flying buttresses, but I loved the whole thing – I respect anyone with the vision and the patience to realize art like this, like Howard Finster and his Paradise Garden. The Etowah River begins near Dahlonega, Georgia, flows southwards and then eastwards, passes through Canton (the seat of Cherokee County and seven miles south of Reinhardt), and then joins the Oostanaula at Rome. The resulting river is named the Coosa; this becomes the Alabama River near Montgomery, and empties into the Gulf of Mexico at Mobile. 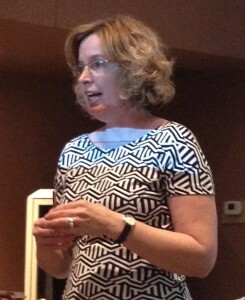 Donna Little speaks at the Funk Heritage Center, 4/20/16. Dr. Little opened the night’s proceedings by showing a map of the area. Nowadays we are used to thinking in terms of I-75 and I-575, the north-south freeways leading to Atlanta, but the Etowah and the Oostanaula run east-west, and that’s the direction that Indians would have been familiar with: thus the Mississippian Etowah Mounds in Cartersville, and New Echota, the capital of the Cherokee Nation, which was not in the middle of nowhere in north Georgia, but on the Oostanaula, which was a major thoroughfare. In 1835, Father [i.e. Nathaniel’s father Lewis Reinhardt] bought a tract of land on the old Pinelog Road [i.e. 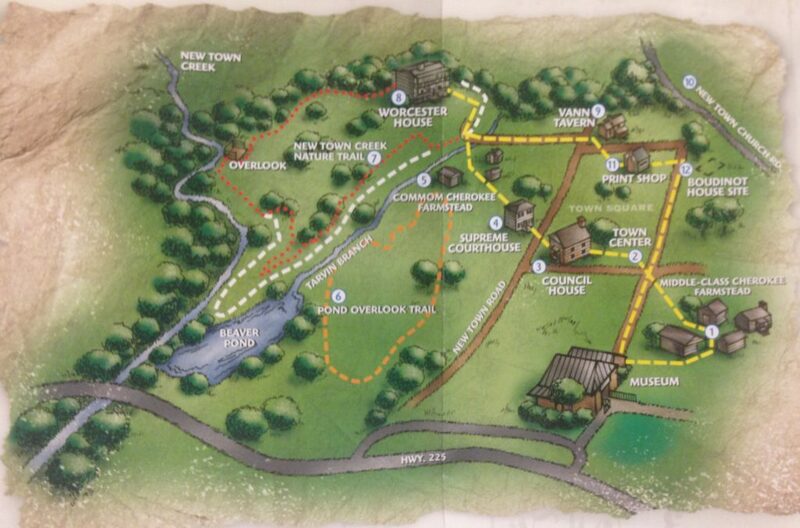 today’s GA-140] some two miles from his mill-place, improved it and in the latter part of 1835 he moved on it. 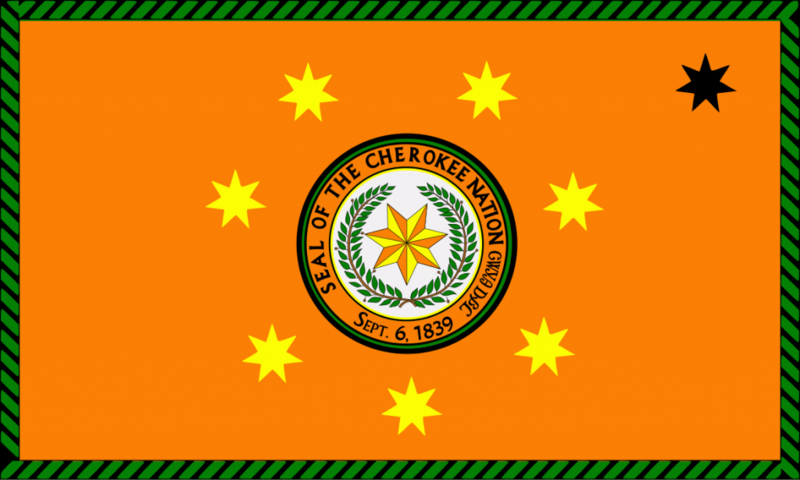 1838… In the spring many U.S. soldiers were passing through the country for the purpose of collecting and removing the Cherokee Indians to the West. They frequently lodged at night at Father’s Saw old Foekiller, a neighbor Indian, just after he had been arrested by the soldiers, who were carrying him to Fort Buffington. They treated him rather cruelly, which excited my sympathies very much in his favor. The old Indian desired to see father, who solicited better treatment in his behalf. He left all his keys with Father. After the Indians had been collected by the soldiers and started on their final march off, they came near our house the first night and camped, I caught the measles from a soldier who lodged with us that night, and had them severely. One of the neighbors came and stayed the night at Father’s from fear of injury by the Indians. The need for a Trail of Tears monument on Reinhardt’s campus (not just an exhibit at the Funk) is very great. Reinhardt History Professor Kenneth Wheeler followed with a talk on the human relationships along the Etowah River, particularly the gold rush of the 1820s and the antebellum iron industry, both of which were ecologically disastrous. He also mentioned how Reinhardt co-founder John Sharp had promoted a steamboat service between Canton and Rome, and how William Nickerson attempted to dredge the Etowah for gold – although the attempt proved uneconomical, and Nickerson later opened a sawmill. Presumably all these characters will appear in Dr. Wheeler’s upcoming book. Keith Ray and Diane Minick. Keith Ray, adjunct professor of biology at Reinhardt (a Reinhardt graduate and Ph.D. candidate at Auburn), mentioned how the Etowah valley is one of about five or six places in the world which, for the past 100 million years or so, has neither been under water, nor under glaciers. This remarkable stability has produced a vast abundance of plant and animal species. (I had no idea this area was so ecologically diverse.) 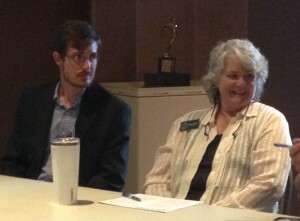 Environmentalists Joe Cook of the Coosa River Basin Initiative and Diane Minick of the Upper Etowah River Alliance spoke of the importance of maintaining this diversity. 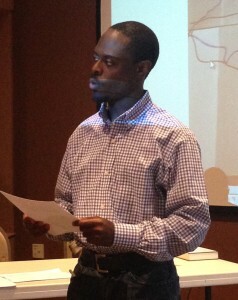 Laurence Stacey, adjunct professor of English at Reinhardt, ended the evening by reading some haiku. Founded in 1883 at the edge of southern Appalachia in northern Georgia, Reinhardt Normal College initially reflected a New South ideology of its German-American founders, who saw the school as part of a larger vision that included mining, business development, and transportation improvements. By 1900, however, a second generation articulated a different story of the college, in which they presented Reinhardt as a missionary outpost among an isolated and ignorant, though promising, population that required moral uplift. For the founding generation, the hilly, even mountainous, topography surrounding their school signified the waterpower that could be harnessed to power mills and factories, but for the second generation the landscape signified a geographically and culturally remote locale in which the school operated. What stayed constant was a racial outlook in which the first generation advocated ridding the area of people of African descent, and the second generation either echoed that aspiration or presented the school as though racial purification had already happened and Reinhardt existed in an all-white setting. Given this history, one can see why the admission of James T. Jordan was such a significant event, and worth remembering. Congratulations are also due to Prof. Wheeler on being awarded a sabbatical leave next spring to work on his book, Creation and Destruction in the Cherokee Country: Georgia’s Etowah Valley 1829-1865. The previous entry on the Cherokee Nation made me think of our visit to the Sequoyah Birthplace Museum in Vonore, Tennessee, which my wife and I saw once. 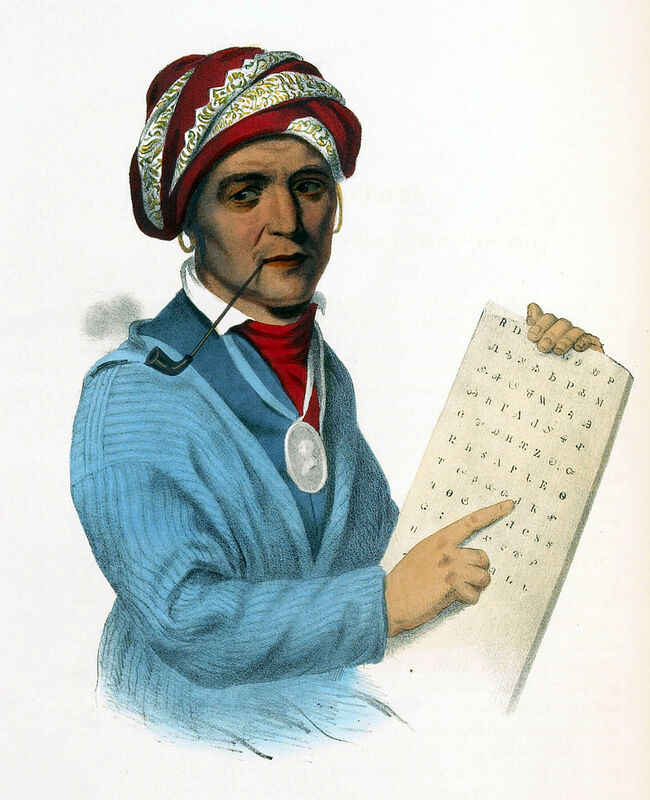 Seqoyah (c. 1770-1840) was a Cherokee silversmith who, impressed by the ability of white people to communicate with each other by means of “talking leaves,” invented from scratch a syllabary of eighty characters for representing the Cherokee language, which continues to be used. Via Wikipedia, this is the most common portrait of Sequoyah, an engraving after an oil painting he sat for in Washington DC on a visit there once. Unfortunately, the museum didn’t do justice to its namesake. The exhibits were not about him so much as they were about the Cherokee themselves, with the film they show you (an hour long, as it turns out) focusing heavily on Cherokee removal and mentioning only briefly such things as the tradition of “inter-clan violence.” The rest of the museum consisted of a meager collection of artifacts, rather poorly displayed. We both thought that if it’s being billed as a Sequoyah museum they should focus on him and then branch out into other issues that he represents: the historic identity of the Cherokee, their contact with Europeans, the whole question of what literacy does to people (including the history of the Cherokee Phoenix), and the question of acculturation: how do we deal with Europeans, by resisting them, or imitating them? Of course you then could still talk about how even the latter didn’t save the Cherokee, due to the stunning bad faith of Andrew Jackson, et al., but you could then follow Sequoyah out to Oklahoma and tell about how the band survives out there to this day. 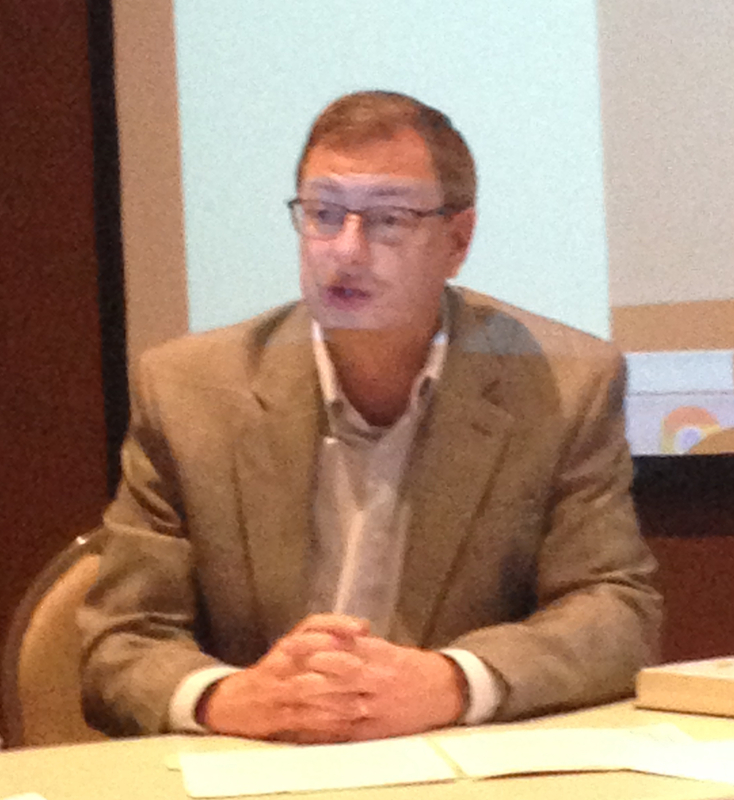 Enjoyed a talk at the Funk Heritage Center last night, entitled “The Cherokee Trail of Tears: Memory and Meaning” by Chief Justice Troy Wayne Poteete of the Cherokee Nation Supreme Court. Chief Justice Poteete is executive director of the National Trail of Tears Association and has served as a delegate to the Cherokee Nation Constitutional Convention. 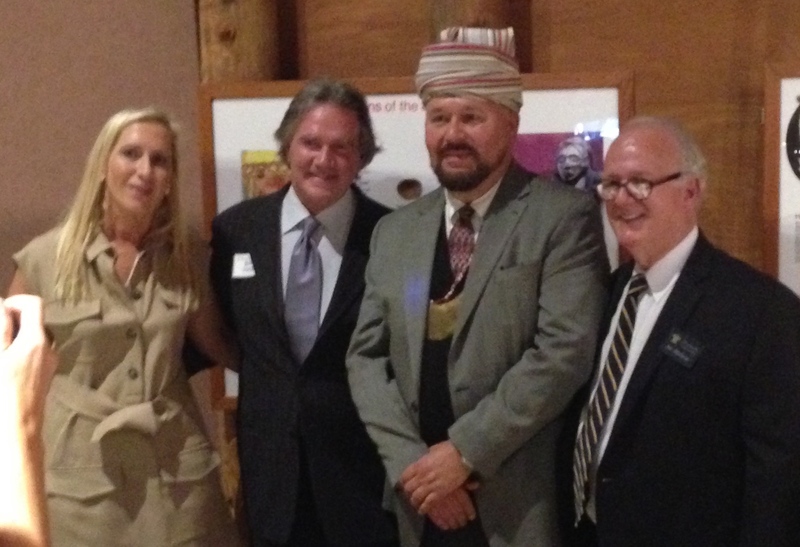 L to R: Martha Hasty, Reinhardt Board Chairman Billy Hasty, Chief Justice Poteete, Funk Heritage Center Director Joe Kitchens. The Funk Heritage Center is now a certified National Park Service Trail of Tears interpretive center, and has received a challenge grant from a foundation that will match donations up to $50,000 for the purpose of exhibiting artifacts excavated at the Hickory Log site in Cherokee County. Donations must be received by November 1, 2015. If you are interested in making a donation, please contact Barbara Starr at 770-720-5967 for information.